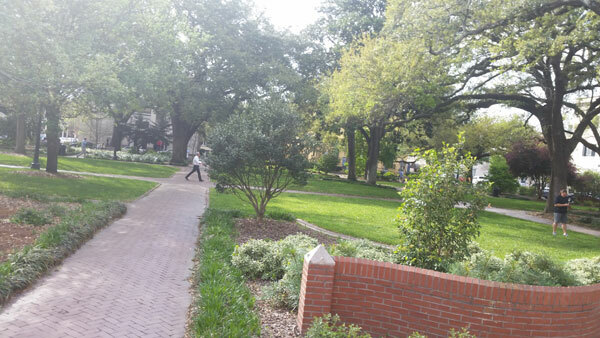 Savannah, Georgia: Spanish moss, a lot of squares, and the attack of a drone! 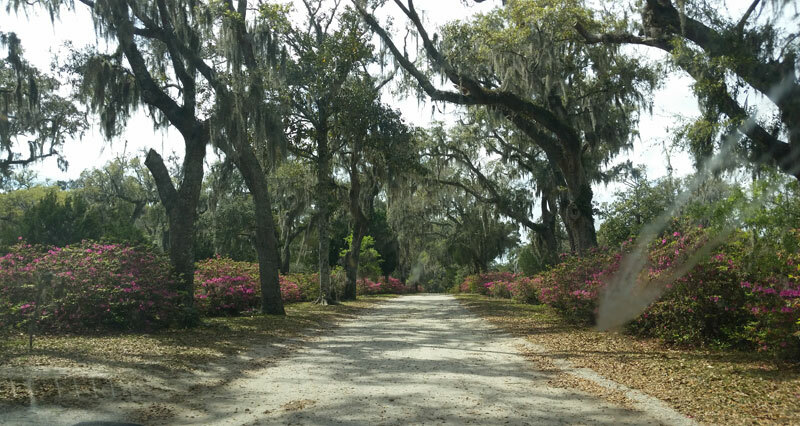 As budget-minded travelers, we stayed in Port Wentworth, which is a 20 or 30-minute drive west of the city, depending on traffic, and boy does Savannah have traffic! Traffic jams, mostly. The first thing we did was take the 90-minute Old Town Trolley Tour and we spent the first 10 minutes stuck on one city block. It probably didn’t help that we’d jumped onto the tour at 4:30pm and hit rush hour, but it did make it easier to find parking in the visitor’s center parking lot where the tour starts. We stopped by the center the next day around noon and had to park in an RV spot because there was literally no other parking. So, pick your poison, bad traffic or bad parking. Other than that, the trolley tour was a great introduction to the city. The trolley had large open windows, which let me take a lot of unobstructed photos. 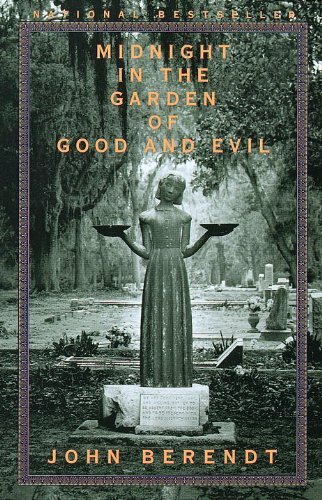 Savannah’s biggest cinematic/literary claim to fame is Midnight in the Garden of Good and Evil, a book that was made into a film of the same name. The “Bird Girl” statue on the cover of the book became so iconic they had to remove it from Bonaventure Cemetery and now display it in the Jepsen Center for the Arts. I could barely spy it in the second story window as we drove past. 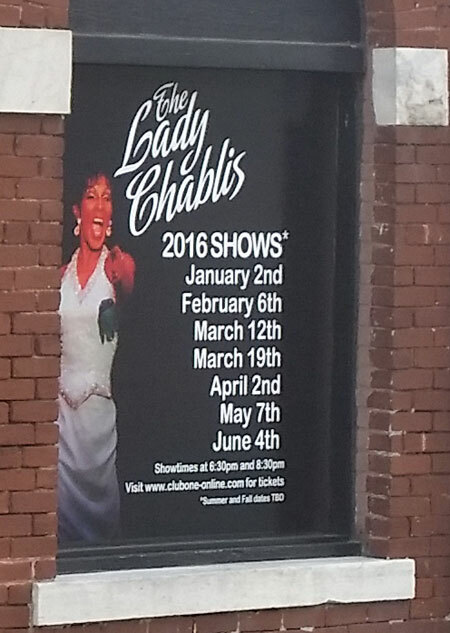 It was much easier to see the poster advertising the Lady Chablis show, who was a memorable character from the film. Nice to know she’s still working! Savannah’s other famous film connection is Forrest Gump. The bus stop that Forrest is sitting at when he tells his stories was filmed here, but the production took the bench with them so all you can look at is the square. The town’s newest film connection is the Baywatch movie which they were filming while we were in town, though I didn’t spot The Rock or The Hoff anywhere. The trolley lets you hop on and hop off at various points, though we stayed on for the whole loop. When we were stuck in traffic, a woman sitting behind us started reading aloud the entire dinner menu for a restaurant off her phone (complete with prices) and made reservations before hopping off at the second stop. The City Market stop and the River Street stop seemed to be the places with the most shopping and heaviest concentration of restaurants and stores. The trolley had to go down a fairly steep, cobblestone road to get to River Street that gave me respect for our driver’s skills. (She used to drive a school bus.) 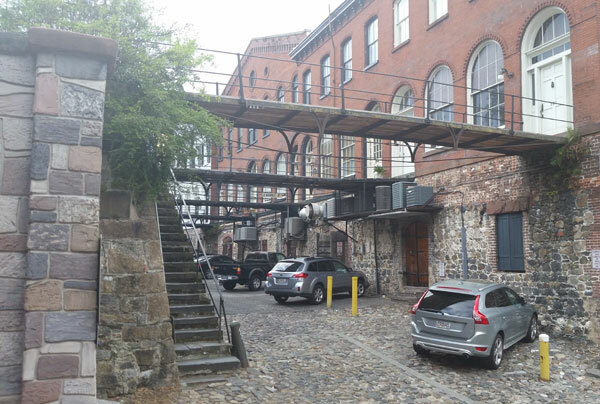 The area by the river used to be used as a cotton exchange, and people called “factors” would stand on these walkways to inspect the goods and broker the prices. 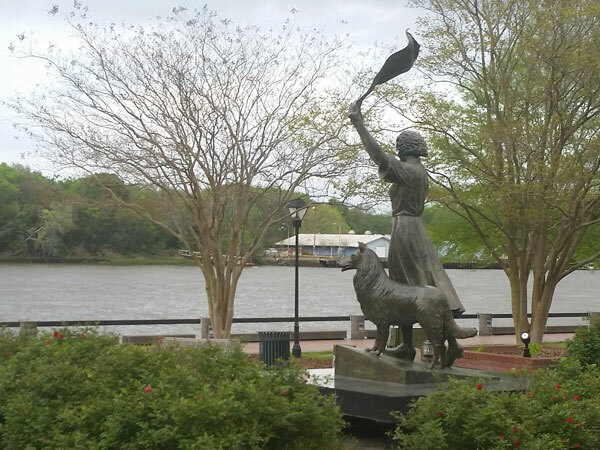 We also passed a statue of a woman named Florence Martus who used to greet ships by waving a handkerchief at them (though it looks more like a towel in the statue). There’s a rumor that she fell in love with a sailor who went off to sea and she started greeting every ship in hope that he was aboard, but he totally jilted her. As our driver, Honey, said, “Honey’s not waiting more than a week for you to get back. Honey’s getting married before you step on a boat.” I have to side with Honey on this one, and hopefully the whole jilted lover story is just a myth and Florence was just the original Walmart greeter. 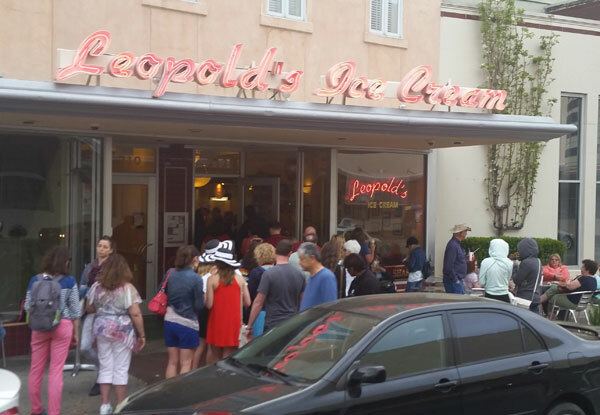 We also passed Leopold’s Ice Cream which is so popular that there’s a long line outside the door at most times. Now, I love me some ice cream, but can it really be that good? I mean, it’s not something rare like a cronut, right? That said, when I was in Paris I decided to eat at a certain bakery specifically because there was a line out the door, which I assumed meant it was a good place to eat. 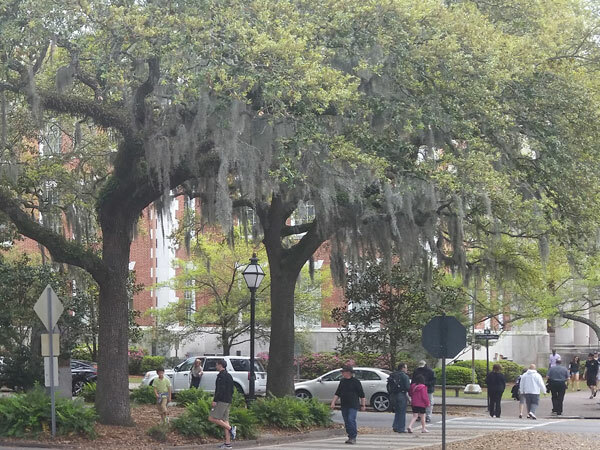 We also saw a lot of Spanish moss hanging from the trees, which is neither Spanish nor moss. Some early settlers stuffed their pillows with it, which was a bad idea because it contains chiggers. That sounds like a form of torture you’d see on Game of Thrones. British General James Oglethorpe led the settlement of Savannah and the Georgia colony. His name came up so many times during the tour that I’m surprised the city isn’t called Oglethorpe City or Oglethorpeville or Oglethorpetown. Savannah is a much lovelier name though, derived from an Indian term. At least they named a street after him, and according to the TV ads, an Oglethorpe Speedway Park which was hosting a monster truck rally that weekend! There were a couple monuments to the confederacy, but overall the legacy of slavery was less prevalent here than it was in Charleston, South Carolina. This might be because Oglethorpe banned slavery in Georgia when Savannah was founded, but when he left several years later it became legal. 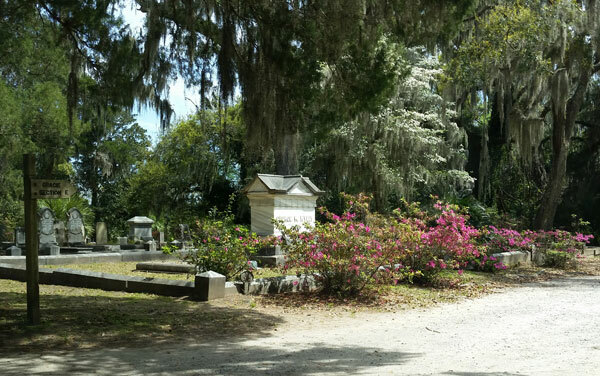 The next day we drove to Bonaventure Cemetery which is on the east side of town, away from the historic district. As we drove up the road to the cemetery, we passed a funeral home and then a monument maker with example headstones on the lawn. All they needed was a hospital or retirement home and that street would be your one-stop path to death. To my mother’s surprise, this place had the best azaleas in the city. It’s the most beautiful cemetery I’ve ever seen. Granted, I don’t visit many cemeteries, but I think this place is hard to top. They have guided walking tours, and thankfully the tour guide talks very loudly because my mom and I were able to overhear the beginning of the tour as we were studying maps on a bench next to the front office. 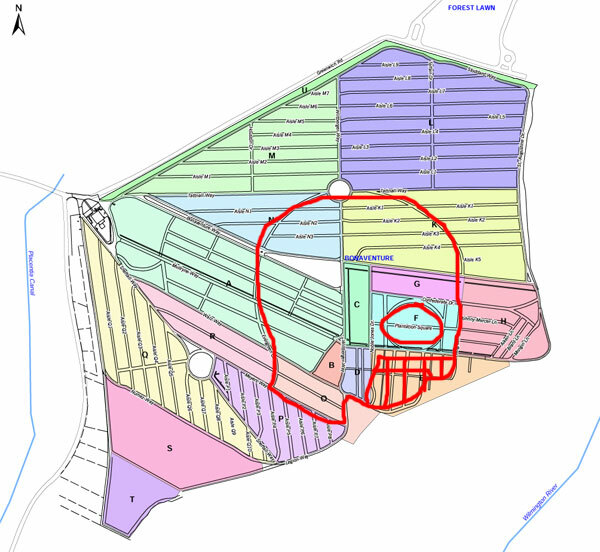 This is how I know there is the vague outline of a skull is hidden in the cemetery design. 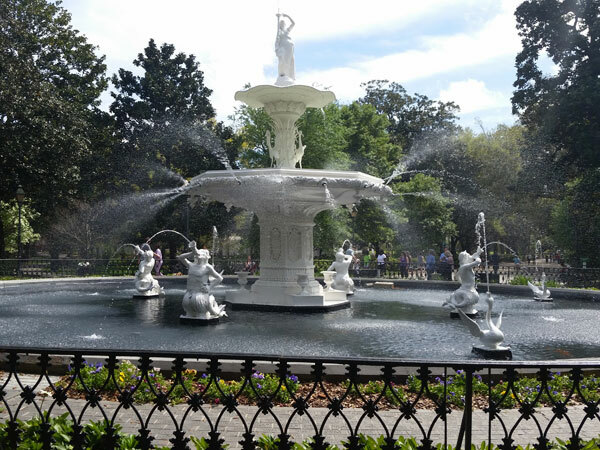 After our drive through the cemetery, we headed to Forsyth Park which has a fountain that appears on a lot of postcards and tourist promotions for Savannah. My mom and I hung out on the benches for a while and there was a non-stop stream of people taking pictures in front of the fountain, so if you want to steal a camera, this is the place to do it. Thirty minutes later, there was something up in the sky. Was it a bird? A plane? No, it was a drone! 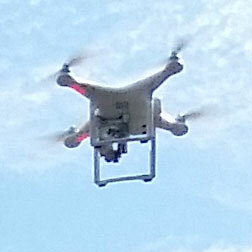 Despite how frequently drones have been covered in the media or used to gather media I’ve watched, I’d never seen one in real life before. This one was much louder and more annoying than I would have anticipated. If I’d walked into the park at that moment, I would have sworn there was a swarm of bees lurking in the trees. I also got the same feeling around the drone that I get when someone won’t stop staring at me. As it buzzed up and down and around, I could have been in its sights at any moment. It was very distracting and unpleasant. I’m sure the drone was getting beautiful footage of the fountain, but I wish it would have buzzed off. We walked to the Fragrant Garden for the blind in the same park, which was closed for the day, but we were still able to take a few strong whiffs of honeysuckle through the iron gate. 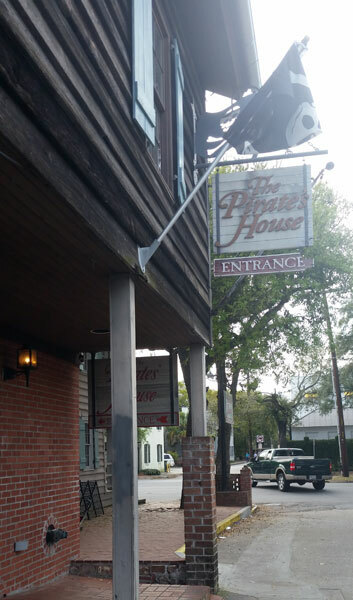 After that, we headed to The Pirate House, a restaurant in a building that used to be an inn for sailors and pirates. Supposedly, if you got too drunk at The Pirate’s House back in the day, you might wake up on a boat headed to China the next day. No one tried to conscript us into service while we were there, though there was someone dressed like a pirate roaming around. They also had paper pirate hats for kids, though it didn’t feel like a kiddie restaurant even with the treasure chest of Dum Dum’s lollipops positioned on the way out. 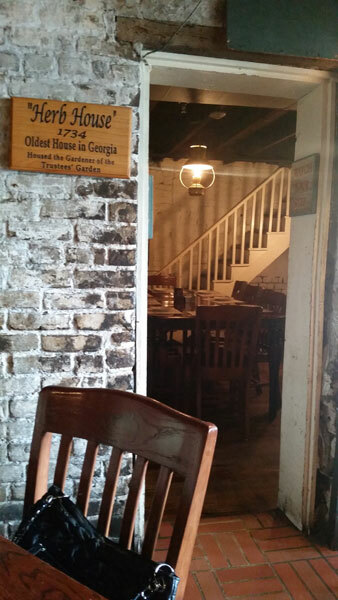 The food was good and our table was next to the entrance to the old “Herb House,” which is the oldest house in Georgia. Strangely, I felt more like a pirate when we returned to our hotel, the Comfort Inn and Suites, which had this sign in the bathroom. And this sticker on the TV set. While I applaud their creative way of telling you they’ll charge you for anything you steal, it did make me wonder how many people had smuggled TV sets out of the building before they felt the need to create these stickers. 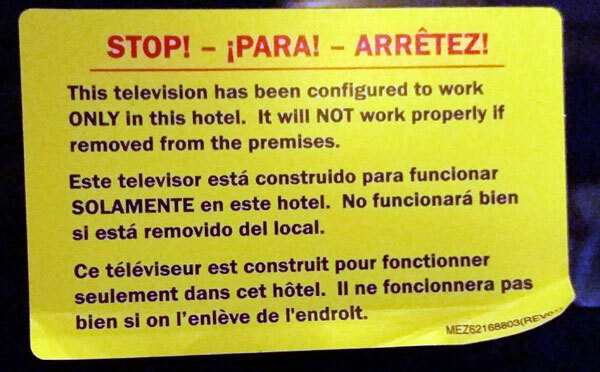 I also have to question the veracity of the statement that the TV won’t work outside of the hotel. My mom and I were able to watch Netflix that night when I plugged her computer into the TV via the HDMI connector and we had no problems. I’m pretty sure you could do that outside the hotel as well. 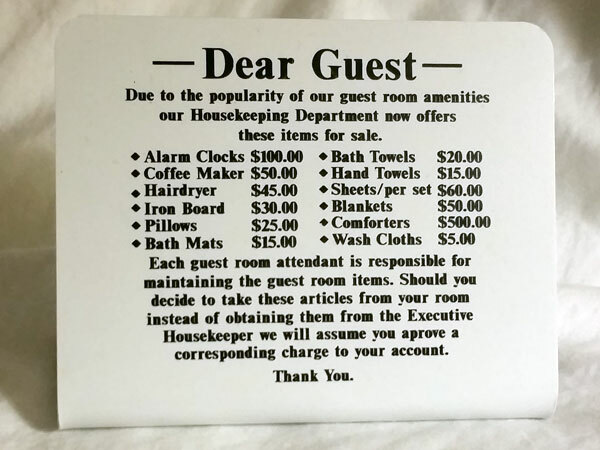 Also, when we first got back to the room our key cards didn’t work, so we had to go to the front desk to have them reset. This place is so secure even the guests can’t get in! There had been some horrible truck fire on the highway not far from us the night before that had backed up traffic for hours, so my Mom and I made sure to make good use of the Google Maps traffic feature and the Waze app on the drive home. When I saw a big stretch of red on the map which indicates a traffic jam, I was able to reroute us onto state roads to avoid it, undoubtedly saving us a lot of time. I’ve tried using these apps when I’ve driven home for the holidays, but it works better to have one person driving while another navigates. 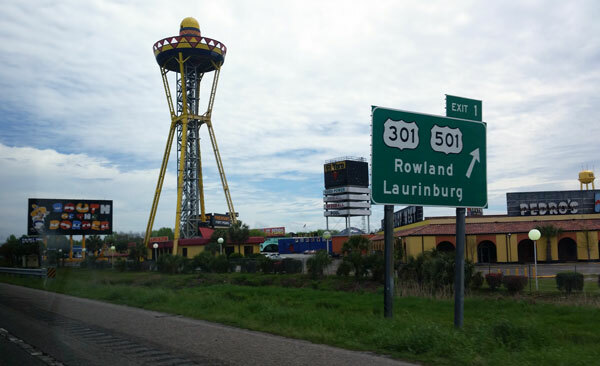 That said, we both got so distracted by South of the Border at the South Carolina/North Carolina border that we missed our exit. Yes, that’s a giant sombrero tower, over 200 feet tall according to their web site. South of the Border also features a reptile park, amusement rides, a restaurant, a motor inn, and a campground. There were billboards advertising this place every other mile all across South Carolina, and that’s not an exaggeration. I almost felt guilty for not stopping since they’d nagged us to visit a dozen times before we even got there. We took US highways back to Chapel Hill instead of the interstate, so I got to see more of rural North Carolina than I’ve seen since I moved here. There were lots of small towns that looked quaint and had clearly been around for many decades, but I’m pretty sure I would hate living in any of them. 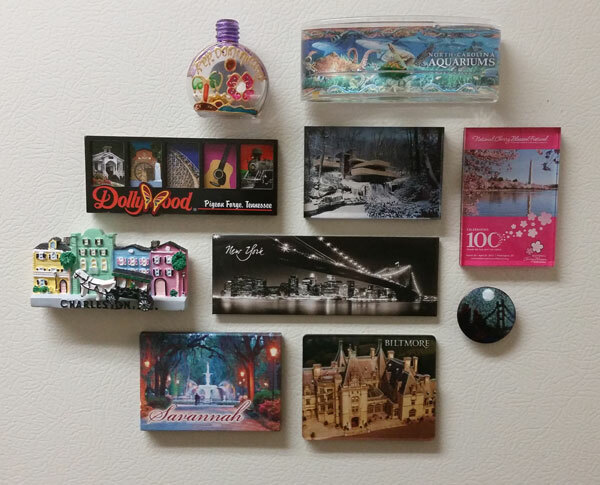 When we got home, I put my latest travel magnet up on the fridge. I’m up to 10 now! Previously, my only time spent in Georgia was at the Atlanta airport, so I’m glad I can say I’ve traveled there for real now. I enjoyed having Georgia on my mind for a few days. 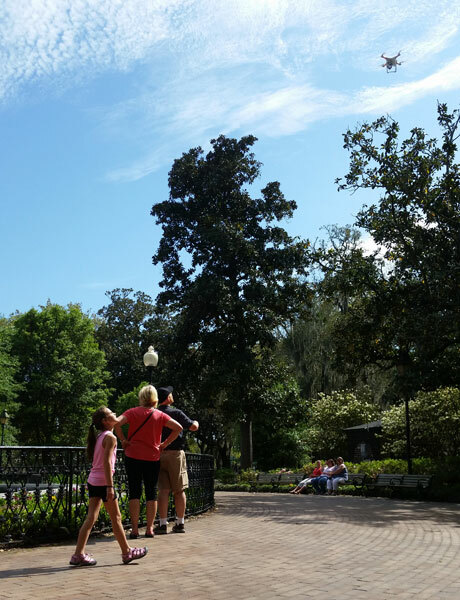 Thanks for the wonderful taste of Savannah, GA. I have wanted to travel there myself. The photos are very nice. I have to start planning a trip. I know what you mean about drones. I was at the beach while one was flying around and I found it very distracting and annoying. Very loud. I ate a cronut a couple of months ago. It was fantastic. Really delish. 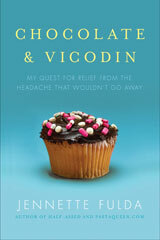 Apropos of nothing, I read both of your books recently and I enjoyed them. 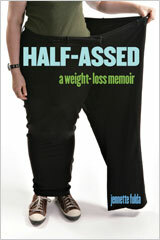 @Kate – Glad to hear it! Thanks for stopping by. Nice re-cap of your trip. I’d like to visit there one day too. The movies make it look so intriguing, but I live in Michigan so it would be a big trip to head down there. Thanks for the sneak peak and highlights of your visit.